Looking to rent a highly capable Toro Dingo TX 525 Wide Track compact utility loader in Rochester NY, Ithaca NY and Western New York? 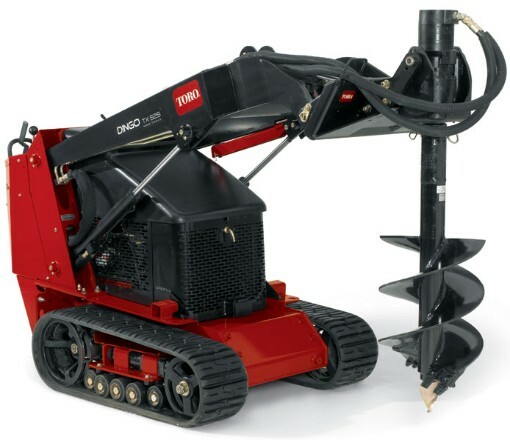 The Duke Company proudly offers the finest rental equipment and prompt pick-up and delivery. Working in confined spaces enabling you to quickly get through standard door ways and gate areas. Gain increased productivity from work that you would have previously done manually. Powerful and durable hydraulics, based on a 4-pump system. Enables the operator to enable multiple functions in parallel, increasing productivity. Stable operation based on the Toro Dingo’s low center of gravity. Enables operations on hills and rough terrain. Very capable 25 horse-power, diesel-powered engine by industry leader – Kohler.